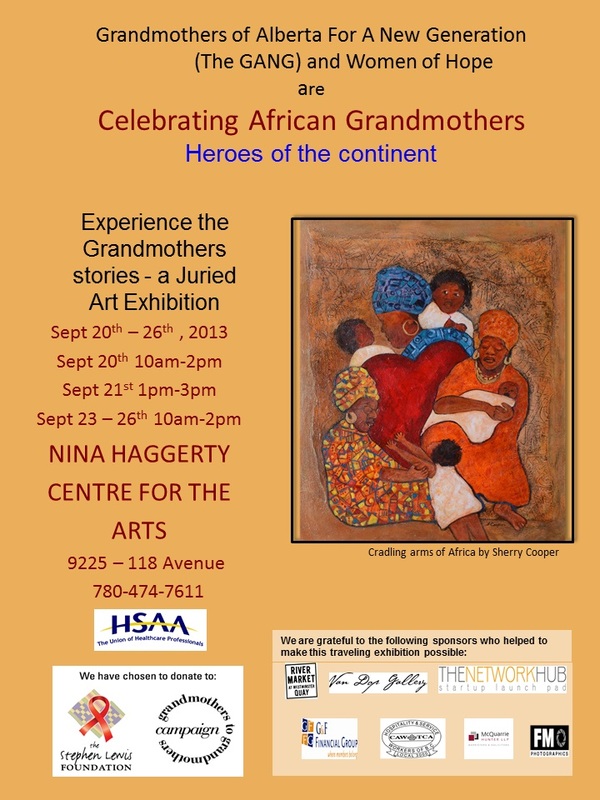 The GANG (Grandmothers of Alberta for a New Generation) is Celebrating African Grandmothers with ART. African grandmothers are leaders in their communities and the primary caregivers for their grandchildren and their immediate families. They work valiantly to fight the stigma of HIV/AIDS, raise awareness about the virus and provide vital care to people living with it. Experts in the work to overcome the pandemic, they are on the frontlines as agents of change. In spite of the heartache and hardships, there are signs everywhere that the tide of AIDS is beginning to turn at the community level. The GANG, a group of 85 Edmonton and area grandmothers who are friends of the Grandmothers to Grandmothers Campaign of the Stephen Lewis Foundation, fundraise to support the work of African grandmothers. The 2013 art show Celebrating African Grandmothers, heroes of the continent, is a juried art exhibition. The call for entries brought 83 submissions from artists in across Canada, the United States and Europe. The 40 pieces selected by the jury tell the story of the hope and small triumphs which light the way to victory over the AIDS pandemic. The artwork provides a window to the world of sub-Saharan African grandmothers and celebrates their tireless work for a safer and brighter future for the next generation. On display at the Nina Haggerty Centre for the Arts the exhibit will then travel to 15 locations in Western Canada from Campbell River to Brandon Manitoba. It will return to New Westminster on the eve of International Women’s Day, March 7, 2014, for a gala auction. African grandmothers are heroic women who meet adversity head-on as they raise their voices in song, move their bodies in rhythm and heal themselves and their communities. We celebrate them! We hope you will share our admiration for the matriarchs of Africa and recognize that, while positive strides have been made, there is still much to be done. Please join us! And The GANG was on TV Again – Two More Times! And The GANG Was On TV Again. Two More Times! First it was with Ryan Jespersen at CityTV on the Breakfast TV show on April 4, 2013. Next it was on Global TV Edmonton News on April 11, 2013. Click below to view the two clips. On March 21, 2013, five GANG members set forth in the blizzard, #YEGSTORM, to meet and assist in a classroom, grade 5/6, at Jackson Heights Elementary School. These students and master teacher, Karen Mosewich, would be creating African angels, as a culmination of their research on the countries that the Stephen Lewis Foundation supports. Our first involvement with the students of this classroom was during Read-In Week in October of 2012. The books chosen gave students a glimpse of and a chance to converse about countries in Sub-Saharan Africa, about grandmothers, and the special needs of their global sisters. They heard about the work of the GANG in Edmonton, about the orphaned African children, and how the hearts and hands of Canadian grandmothers are reaching out to undertake meaningful and effective projects in 15 African nations through the Stephen Lewis Foundation. By the grace of an engaged and globally aware teacher, we were able to together devise a program for her class. It would serve to encourage her students’ involvement, and address her own curriculum plans. The students chose one African country (from among the Foundation-involved countries) to develop a report with subtopics and expectations outlined. This research paper was important as an indicator of their language arts research skills, their ability to express themselves in writing, and in developing their presentation skills in sharing their finished product. This work was also a valuable evaluation tool for their teacher. The students accomplished their task over a period of time, with a variety and significant amount of learnings clearly demonstrated. The projects were ultimately proudly displayed in a school showcase. The culminating activity was making African angels – the exciting and creative activity that proved to be both engaging and fun. 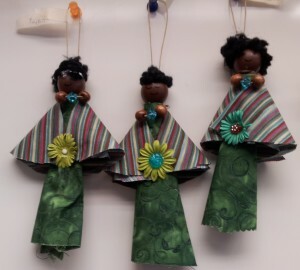 With five GANG members as assistants (special thanks are due to Joyce Madsen, Jan McGregor, Judy Dube, Diane Stewart, and Vivian Pich), and some volunteer parents, the students spent a half-day creating angels. The extensive preliminary work done by Karen, their teacher, was paramount in the success of this endeavor. The students’ angels turned out beautifully. Among the many creative designs and expressions was a set of “Triplet Angels”, identical in garb, but distinctive in bling. They were created by three boys who collaborated both in and out of school. They epitomized the genial and fun atmosphere of this creative day. 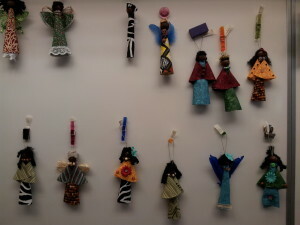 Now the angels will be sold to parents and, hopefully, at other community events. The students have a huge sense of pride and exhibited so much joy in being able to express their passion, global awareness, and engagement. They all recognize that they can and do have a personal hand in assisting African orphans and grandmothers. Below is a page from the Dec 28, 2012 issue of the Edmonton Journal. As you can see, the GANG’s Book “Stirring Memories” was included in their list of the Best of 2012. How wonderful! For more information, incuding how to purchase the book: Click Here.